Bison steaks are widely available, naturally lean and deeply flavorful. But don't overcook them. 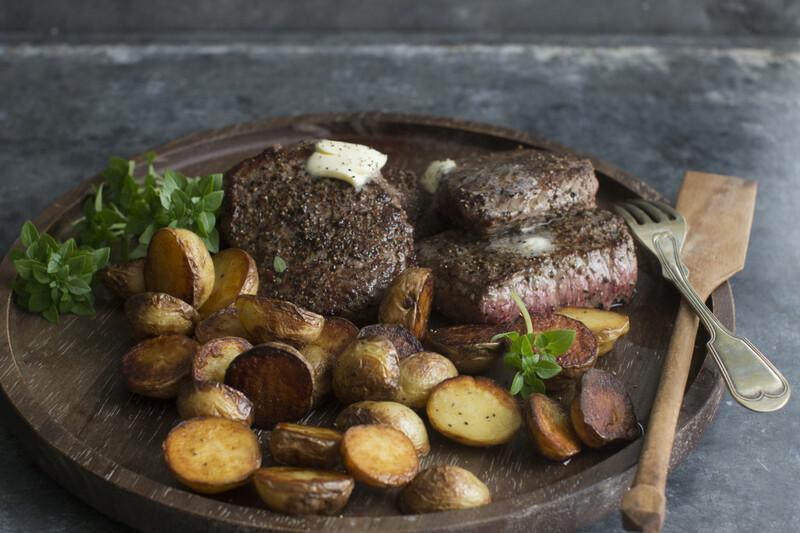 A steak and potato dinner is an American cliche, but a delicious one. And in my mind, that gives us leave to play with — and enjoy — it without feeling guilty. For my weeknight-friendly steak and taters, it was important to me that it be a one-pan wonder. Nobody wants tons of cleaning up on a weeknight. It also had to be fast and flavorful, which is why I opted for bison steaks. This widely available alternative to beef is naturally lean and deeply flavorful. That leanness means you need to cook it quickly and only to medium-rare. If this meal has you feeling guilty — as if maybe you should try to squeeze some veggies into dinner — cut up some carrots into chunks roughly the size of the halved potatoes and add them at the same time. Season the steaks on both sides with salt. Spread the pepper on a salad plate, then press both sides of each steak into the pepper to coat. The steaks can be coated with each diner’s desired level of pepper. Set aside. In a large cast-iron skillet over medium-high, melt 4 tablespoons of the butter. Add the potatoes and cook, stirring often, until well browned and crisp outside and tender inside, about 15 minutes. Season with salt, then transfer the potatoes to a plate and cover with foil and a kitchen towel to keep warm. Return the skillet to high heat. If the skillet is too dry, add a splash of olive oil. Add the steaks to the skillet and sear on each side for 2 to 3 minutes for medium-rare. Bison steaks should not be cooked beyond this point or they will become tough and lose flavor. Divide the steaks and potatoes between 4 serving plates. Immediately top each steak with 1/2 tablespoon of the remaining butter. Let rest several minutes before serving. Nutrition information per serving: 470 calories; 180 calories from fat (38 percent of total calories); 21 g fat (12 g saturated; 0.5 g trans fats); 150 mg cholesterol; 32 g carbohydrate; 3 g fiber; 1 g sugar; 41 g protein; 580 mg sodium.